Divan Brasserie Beyoğlu is residing on top of a renovated han (large commerce building) that also harbors Koç University’s Research Center for Anatolian Civilizations. With a terrace overlooking the Bosphorus and the historic old city the restaurant is a great choice for extended luncheons, after-work cocktails, and romantic dinner dates. 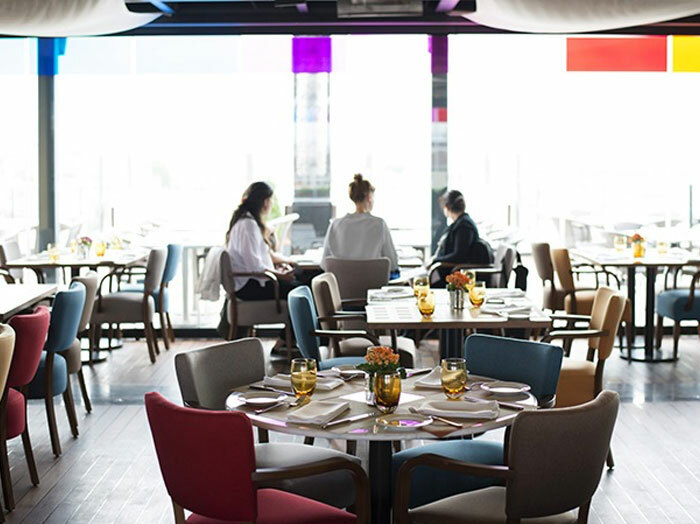 When making a reservation, ask for a table by the windows facing Bosphorus, or, if the weather allows it, request to be seated in the terrace’s central booth. The lower level presents itself as a light-flooded loft, complete with a fireplace lounge and a bar in its center. Thanks to flexible wall systems the space can be divided into separate rooms for workshops, conferences, and private events. Divan Brasserie’s menu is a journey through Mediterranean cuisine and international classics, featuring dishes like prawn cocktail and club sandwich alongside pasta, pizza, Risotto, and a selection of grilled meat and seafood. Dishes are presented according to Divan’s established quality standards, a standard that is perfectly materialized in the colorfully arranged octopus Carpaccio, in which green beans, potatoes, and zesty vinaigrette come together to create a delicious tableau. Another beautifully presented and equally tasty dish is the ağır ateşte dana kürek(beef brisket slow cooked to perfection). The tender meat served on eggplant puree is a surprisingly light twist on Turkish beef dishes, and it left us craving for more. Divan Brasserie’s bruschetta (roasted bread with various toppings) and pizza are crisp, their well-balanced toppings fresh in color and taste. Divan Brasserie’s quality cuisine, attentive staff and unique location make it a haven for shoppers, tourists, and locals alike, offering elegant refuge, delicious fare, and a proper drink from the bar should you need one.